Sitting among lush gardens, beside a gorgeous palm-fringed beach, the BlueBay Grand Esmeralda, in Playa del Carmen, is the ideal destination for a luxurious holiday. Guest can relax to their heart’s content beside 1 of the 3 glorious swimming pools, or drift away on the sand, listening to the waves lapping the private beach. The BlueBay Grand Esmeralda also boasts a spa, gym and its own night club, while young travellers are well catered for with a mini club and children’s activities. If you find yourself needing to cool of a little, the hotel’s elegant rooms provide a great place to recharge your batteries, while you can enjoy a range of cuisines from around the world at the BlueBay Grand Esmeralda’s 7 restaurants. The all-inclusive package also adds to the holiday experience, helping to take the worry out of mealtime. When you’re feeling refreshed, it could be time to explore a little bit more of Mexico. 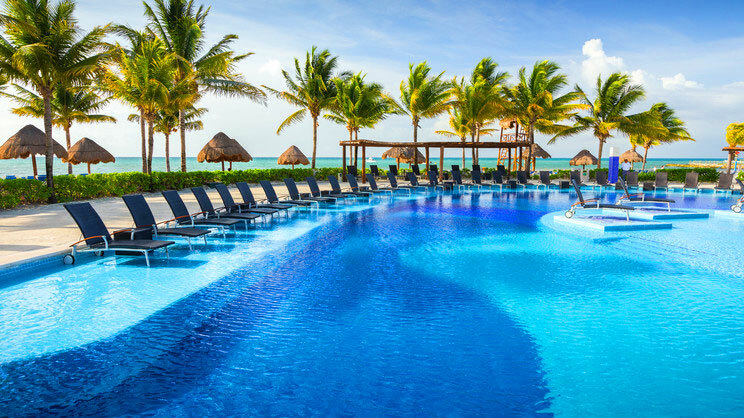 The BlueBay Grand Esmeralda is close to a number of fantastic attractions, with the Mayan ruins in Tulum, Xel-Ha aquatic theme park and Xcaret eco-archaeological park all within driving distance. Golfers will be pleased to know that there are a number of courses nearby, while the waters off the coast are great for scuba diving and snorkelling. So, whether you’re seeking a romantic getaway, a once in a lifetime family holiday, or a dream wedding venue, the BlueBay Grand Esmeralda ticks all the boxes. The BlueBay Grand Esmeralda is located right next its own private beach. The BlueBay Grand Esmeralda is approximately 12km away from the centre of Playa del Carmen. A number of golf courses can also be found nearby, while the Xcaret eco-archaeological park is around 20km away from the BlueBay Grand Esmeralda and the Xel-Ha Park aquatic theme park is approximately 60km away. Holidaymakers can also visit the Mayan ruins in Tulum 72km away. Cancun International Airport is approximately 48km away from the BlueBay Grand Esmeralda. 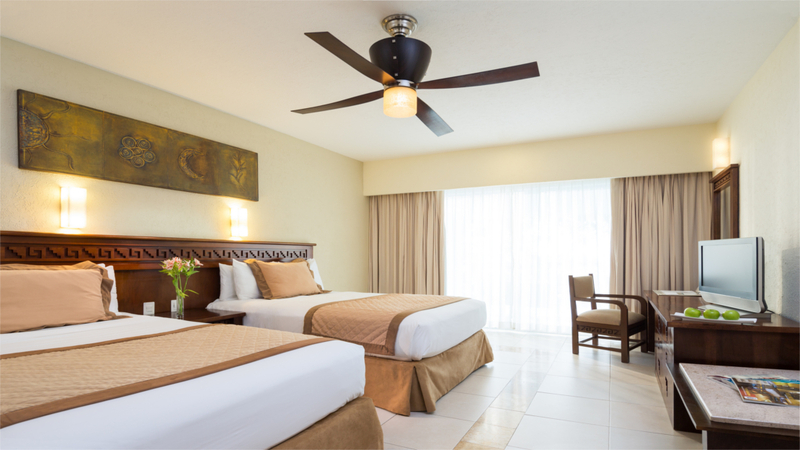 These spacious rooms provide all guests with all the comforts needed during their sun-soaked Mexican break. The elegantly-furnished Deluxe Rooms feature either 2 double beds or 1 king-size bed. Deluxe Rooms are available with garden, ocean or partial ocean views. These rooms can accommodate a maximum of 4 people. Guests staying in these elegant suites can enjoy the luxury of a private Jacuzzi on the spacious terrace. 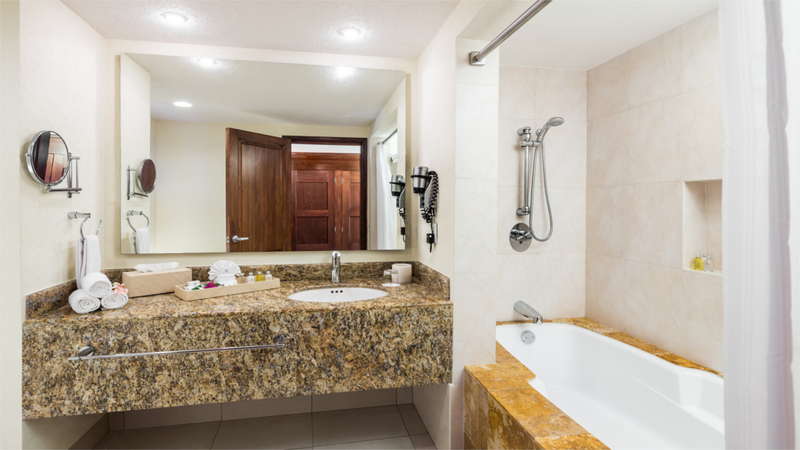 The Deluxe Jacuzzi Suites also feature a king-size bed, a lounge, dining room and extra bathroom. These rooms can accommodate a maximum of 4 people. The BlueBay Grand Esmeralda’s all-inclusive package allows guests to fully relax during their holiday happy in the knowledge that all their meals, snacks and drinks are catered for. Guests can tuck into a buffet meal at the BlueBay Grand Esmeralda’s international buffet restaurant. Open from 7am to 11am and 12noon to 5pm. Enjoy a slice of Italy at the BlueBay Grand Esmeralda’s a la carte Italian Restaurant. Open from 6pm to 10pm. Booking required. Spice up your holiday with a traditional Mexican meal. Open from 6pm to 10pm. Booking required. Sample the delights of France at this fantastic a la carte restaurant. Open from 6pm to 10pm. Booking required. If you’re in the mood for seafood, this is the place to go for a delicious a la carte meal. Open from 6pm to 10pm. Booking required. The BlueBay Grand Esmeralda’s American Restaurant is the place to go for delicious meat dishes. Open from 6pm to 10pm. Booking required. Take a trip to the Orient with a delicious meal at the BlueBay Grand Esmeralda’s Oriental Restaurant.